The darkness has long been a home for fear. Our avoidance of nighttime is instinctual, Darwinian. We cannot know what we cannot see. The formlessness of that unknown drives our imaginations to sculpt unnerving representations of evil. Demons, nightmares, and myths roam the night, serving as a mindful warning to children who would otherwise adventure into the darkness. Survival is a game best played in the light. But what happens when your only chance of survival is in the dark? When your journey to a better life necessitates the cloak of nighttime? 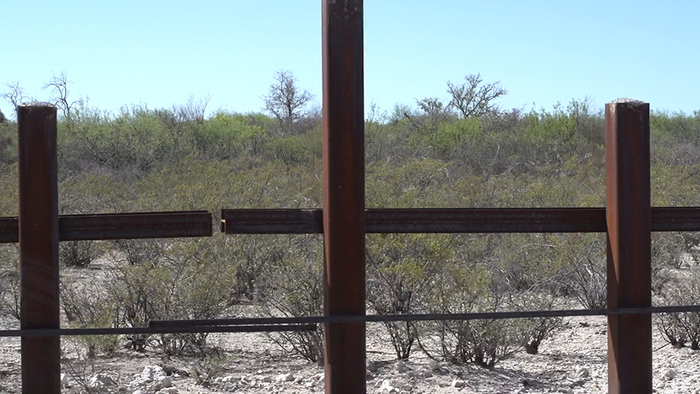 An instructive companion to their current work in the Whitney Biennial, Postcommodity’s Coyotaje at Art in General shows how the aggressive decoy tactics of U.S. Border Patrol agents have already transgressed into the longstanding mythos of the surrounding Mexican border towns—making the journey across the border even more terrifying. 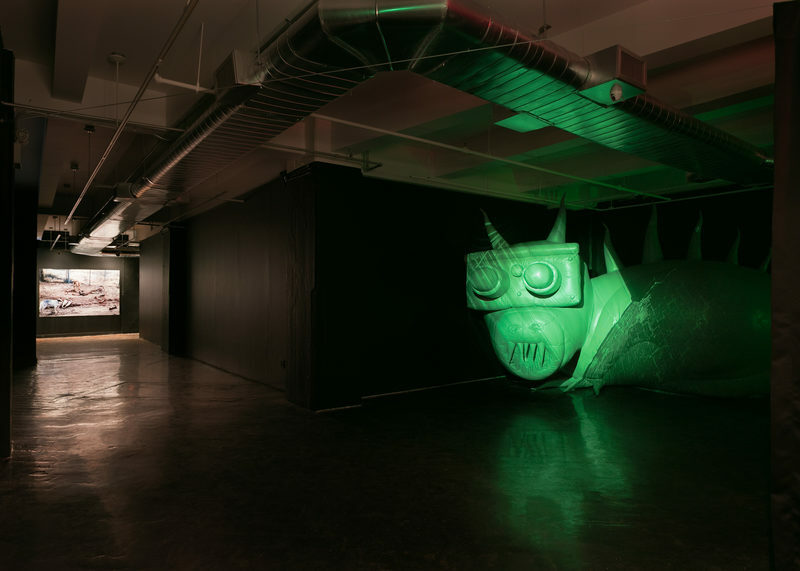 Postcommodity (Raven Chacon, Cristóbal Martínez, and Kade L. Twist) is an interdisciplinary art collective aiming to amplify 21st-century socio-economic and political criticism with an indigenous perspective. The primary target of their work has been the border wall between the United States and Mexico. This “fence,” a loaded symbol in contemporary politics, is also a physical metaphor for Postcommodity, who see it as calcifying the historic denigration of indigenous rights and immigrant humanity. Currently on view at the Whitney Biennial, A Very Long Line (2016) demonstrates Postcommodity’s adept use of immersive video and sound manipulation to visually distill the contradistinctive tranquility and violence of the borderlands. More precisely, the peace we see in the natural landscapes of the borderland towns and deserts eerily underscores the silent war on immigrants occurring in that very same place. Coyotaje feels like the logical conclusion to that previous piece, showing how quotidian violence at the border can seep into the cultural consciousness, enforcing and reinforcing old myths with new relevance. Whereas A Very Long Line is contemplative, Coyotaje is thrilling and manic. 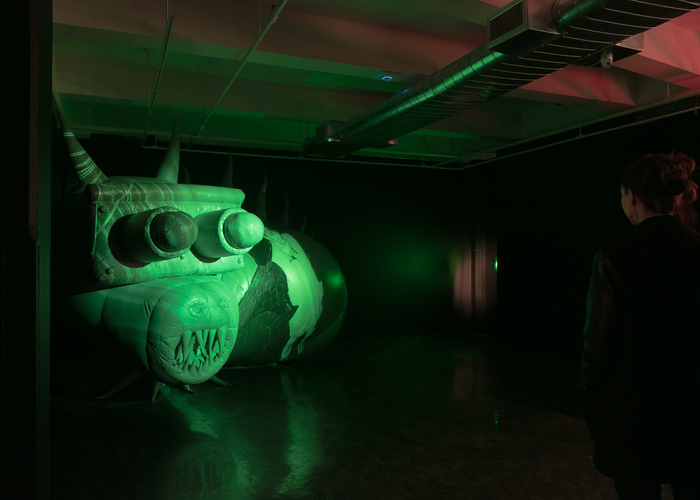 The exhibition begins in disorienting darkness, out of which an enormous monster emerges. With sharp fangs, large eyes and a green night-vision glow, this apparition could be easily mistaken for one of the most infamous demons of Latin American lore: the chupacabra. A closer look at it, however, reveals its glib fabrication. This is not a real monster, but a decoy representing the many decoys U.S. Border Patrol agents use to bend an individual’s path a certain way, making them easier to capture. Like the chupacabra who hunts animals in folktales, this modern-day beast hunts people. And as you step toward the monster, two things happen. First, you see yourself refracted onto the monster’s body via an unseen projector. Are you becoming the monster? Are you complicit in the monster’s work? Second, you hear frantic whispers comings from your left. In Spanish, a voice pleads for you to follow him, to come to him and away from the patrolling monster’s gaze. As you edge toward the voice, another voice emerges from farther down the hallway, telling you that that demon is, in fact, the chupacabra. With each subsequent dispatch, you become less certain about your position in this narrative and more certain about the presence of danger. Could these voices just be more sonic decoys leading you into a border agent’s trap? After all this manipulation, you arrive at the end of the hallway with a single, large-scale photograph on the wall. 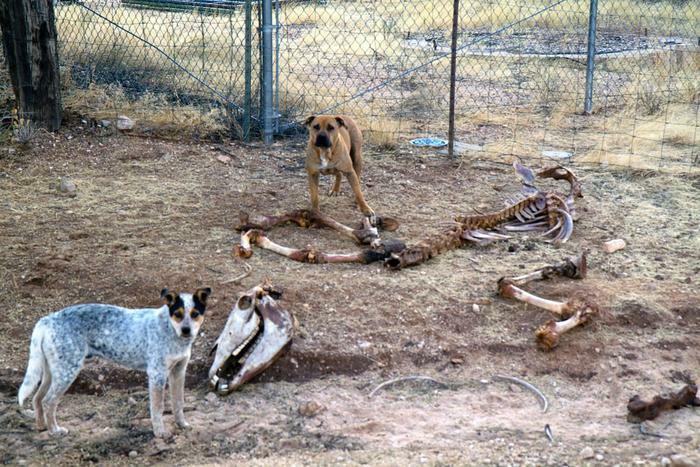 Es más alcanzable de lo que se imaginaban depicts the skeletal remains of a horse, with two dogs looking anxiously at the viewer. Like a predator who plays with its prey before killing it, the chupacabra plays with us. The great manipulation here might not be the visual and sonic decoys that lead us into the chupacabra’s trap, but rather how Postcommodity shifts our own expectations in the piece. In the darkness, we become both officer and immigrant, hunter and hunted. Yet, when we experience the fear and disorientation of the border patrol’s nighttime decoys, our empathy goes squarely to the immigrants. From their viewpoint, we see Americans as the new chupacabras. The demons are not undocumented immigrants, but those of us who want to keep them out with nefarious tactics. Postcommodity’s Coyotaje continues at Art in General through June 3, 2017. Zachary Small is a New York-based genderqueer writer. He’s written for many publications including Hyperallergic, BOMB Magazine, Artinfo Magazine, and HowlRound. He was recently named the 2017 recipient of the CUE Foundation’s Young Art Critic Mentorship Program. His latest play, /VANITAS/ debuted at Dixon Place. He tweets from @ZSmall93 and can be reached at zsmall93[at]gmail[dot]com.